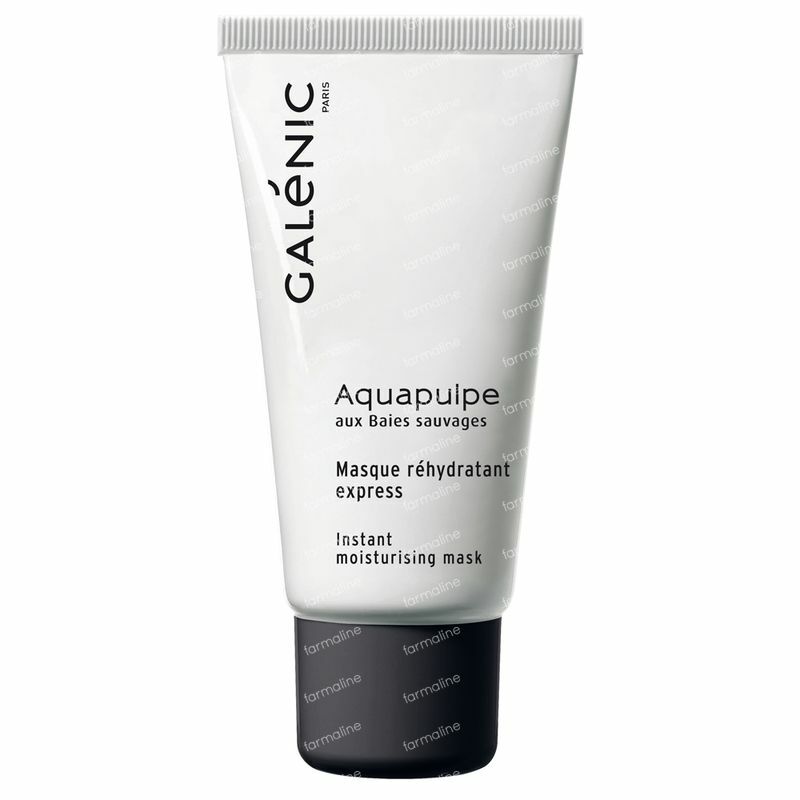 Galénic Aquapulpe Instant Moisturising Mask 50 ml order online. This Galénic Aquapulpe Instant Moisturising Mask acts like an SOS treatment for parched skin that feels tight and uncomfortable. The patented wild berries complex instantly rehydrates skin and provides enough moisture to combat dehydration. In a mere 2 minutes skin wil feel comfortable and supple once more, a guaranteed soft skin effect, perfect for travel and people with stressed skin. - A patented wild berries complex with extracts from blackberries, raspberries and blueberries helps skin to retain moisture much longer. Providing a water reserve for the skin that suffers from dehydration, lack of radiance and dry lines. - Hydra-reserve system with osmo-regulating active ingredients promotes water distribution and exchanges within the skin to make sure that the moisture levels throughout the skin are optimal. - Hyaluronic acid as a moisture magnet to bind hydration to the skin. - Mask formulated without phenoxyethanol. An express hydration treatment mask with wild berries complex for parched skintypes. - Apply a generous layer of mask to face and neck after cleansing, 1-2 times per week will suffice to keep dehydration at bay. - After 2 minutes, remove excess product with a cotton pad as needed. Do not rinse. - For a more intense treatment leave the mask on for 10-15 minutes, or even sleep it in as an overnight hydration treatment. WATER (AQUA), C12-15 ALKYL BENZOATE, BETAINE, GLYCERIN, DIMETHICONE, BUTYROSPERMUM PARKII (SHEA BUTTER) (BUTYROSPERMUM PARKII BUTTER), ACRYLATES/C10-30 ALKYL ACRYLATE CROSSPOLYMER, CARBOMER, CHLORPHENESIN, DISODIUM EDTA, FRAGRANCE (PARFUM), GLYCERYL ACRYLATE/ACRYLIC ACID COPOLYMER, MENTHOL, METHYLPARABEN, PROPYLENE GLYCOL, PROPYLPARABEN, RED 33 (CI 17200), RIBES RUBRUM (CURRANT) FRUIT EXTRACT (RIBES RUBRUM FRUIT EXTRACT), RUBUS IDAEUS (RASPBERRY) FRUIT EXTRACT (RUBUS IDAEUS FRUIT EXTRACT), SODIUM BENZOATE, SODIUM HYALURONATE, TRIETHANOLAMINE, VACCINIUM MYRTILLUS FRUIT EXTRACT.